I have also started working on some Epic Bowelburnaz. 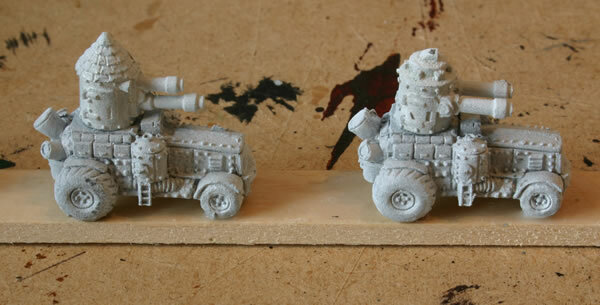 Some of these have been converted as I wanted to use the smaller turrets on other conversions. These have turrets from Battlefortresses. First job is to paint the wheels black. They will also be in the desert camouflage scheme. I am using different shades of brown (and orange on other vehicles) to create a uniformed mass of irregular Orks. I then added my usual ink and paint wash. This photo was taken when the ink was still wet. The next stage is to give them a drybrush and put them on bases.